Urs-B. Hauser, Hotel Belvedere (Grindelwald): family traditions with more than 100 – years old history! What can be more important than family?! What can be more important than traditions?! What can be more important than impeccable service?! Ski web portal skitours.com.ua presents you an interview with one of the most experienced and successful hoteliers of Switzerland. Let us to introduce you to Mr Urs-B. Hauser – a representative of the 3rd generation of hotel managers, who have been managing one of the best Swiss hotels – Belvedere Swiss Quality Hotel Grindelwald 4*. He can be called as «family traditions successor», because he took over the helm of state of the hotel from his father-grandfather more than 30 years ago. We wanted to know about hotel business changes for the last years, which difficulties hoteliers face to and how they see the future of hotel business in the coming years. SkiT. : Mr. Hauser, you family has owned the hotel Belvedere for more than 50 years, and you’ve been managing it for almost 30 years. When you took over your family business, there was so far to the current information age, there were other behaviors and times. If to compare hospitality business now and 30 years later, what like has it become? What has changed in it for the last 3 decades? U-B. H.: First of all, it was my grandfather who built the hotel and that was between 1904 and 1907, therefore not 50, but over 100 years ago. I am now the third generation managing it, actually I started to work with my father 35 years ago. Everything has changed since then, really everything. At that time, the guests came mainly from Great Britain, Germany, France, USA, Canada and of course Switzerland. In the summer season, many Japanese already visited the hotel. The guests all stayed at least 1 week, most of them 2 or 3 weeks, the only exception were the Japanese in summer, who stayed only 2-3 nights. About 15 years ago, the first clients from Russia and Ukraine started to come also. They however also stayed longer, most of them 10 to 14 nights. As many of these guests could not speak any English, I decided to learn Russian to be able to help these clients, to show them that they are very welcome and that we are happy to have them with us in our hotel. We now translate our menu to Russian, have Russian TV channels and would we get many Russians again after New Year, we would again make sure that a Russian speaking person would be here to offer an even better service. Now almost all the guests stay 1-3 nights, only very few stay longer. And now they mainly come from Korea, Taiwan, Hongkong, in the summer also from Arabic countries and also still from Switzerland. 30 years ago, all the guests booked half board and loved to eat at the hotel. Now only very few guests still eat at the hotel, most of them eat outside. 30 years ago, no guests from outside came to eat at the Belvedere, now more and more do. 30 years ago, the staff costs were much lower, there was no VAT, also many other kind of taxes need to be paid. 30 years ago, the Swiss Franc was not so strong, for Americans, British and other nations Switzerland was cheap. SkiT. : Going before the next question, I would like to notice, that in the recent interview for our ski web portal a hotel «Chedi Andermatt» and Andermatt resort emphasized, that the local commune, resort and hotel cooperate with each other successfully. How effective is a team-work of hoteliers and local commune in Grindelwald? Frequently communes slowdown with decision making of a region planning, as it was during the merging of ski zones of Arosa and Lenzerheide. What contribution has the local commune done to make Grindelwald more popular among tourists? How closely do you work with local authorities, promoting Grindelwald and Belvedere brands? U-B. H.: In Andermatt everything has changed since Mr. Sawiris decided to invest billions into the resort. Such big investments make everything very easy. Before Sawiris decided to invest, Andermatt was in terrible shape, almost dead. Thanks to the investments of Sawiris, everything has changed in Andermatt and he also had the necessary power to make sure, that everybody started to work together. Andermatt can therefore not be compared to any other resort in the Alps. Grindelwald is a member of «Best of the Alps». Grindelwald is therefore already promoted through that organization. Also the Jungfrau Marketing Tourism and Grindelwald Tourism are marketing Grindelwald by going to Travel Fares all over the world and by visiting Travel Agencies and Tour Operators all over the world. I, myself, travel to Asia for one month each year, to visit our partners. Before the Ruble plunched, I also visited Russia and Ukraine every year, to visit my partners there. Then there are the Jungfrau Railways with one of the most popular excursion in the world, Jungfraujoch. Over 1 million visitors come here every year. The Jungfrau railways have themselves their representatives in all countries of Asia and also some countries in Europe and America. They make a lot of promotion for Jungfraujoch and of course at the same time for Grindelwald. We are welcoming, almost on a daily basis, journalists and tour operators from all over the world, who are invited to stay here and then help to promote us. SkiT. : Having visited Grindelwald, I was excited by the variety of nations were there. How can you explain such incredible attention of Grindelwald? And what are specific features of Grindelwald if to compare with other elite Swiss resort – Davos, St. Moritz, Crans-Montana or Zermatt? U-B. 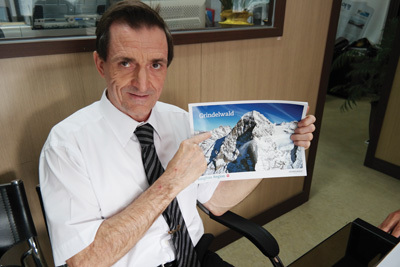 H.: The fantastic marketing of the Jungfrau railways in Asia long before they started to travel, made Jungfraujoch and the Jungfrau area very popular in these countries. These people did not know anything about Europe, except may be London and Paris, but they already had heard about Jungfraujoch. Nature here in Grindelwald is unique, the mountain scenery cannot be beaten by anybody else. Nowhere, such big mountains stand up in front of a beautiful mountain valley. SkiT. : Due to world economic crisis Switzerland has recently refused from CHF Frank strict currency peg to euro and dollars. Have this fact affected on Swiss tourism development, on region activity as a whole and your hotel, in particular? U-B. H.: Unfortunately, the guys on the stock market want to make a lot of money, by making the Swiss Franc stronger and stronger. This made Switzerland about 40% more expensive and that just due to the change of the exchange rate. This has not only affected many companies exporting goods, it has also affected the tourism very strongly. Due to the very high costs (highest salaries of the world), the Swiss hotels are unable to lower their rates. Due to the expensive Swiss Franc, business has gone down a lot. In some tourism areas of Switzerland, every year now, the number of visitors did shrink. For Grindelwald, the problem, thanks to Jungfraujoch, exists only in the winter time. Also the Belvedere was always fully booked from Christmas to Easter, with skiers coming one or two weeks. Now Swiss come for the weekend and during the week, the skiing area is very quiet. For the Belvedere, winter business has decreased by about 25%. SkiT. : What are you, as the Hotel Manager, doing for ensuring of hotel overnights high rates? U-B. H.: We keep renovating rooms, we reinvest every Swiss Franc of profit into the hotel and we try to keep up the best possible service and a very high quality of food. On the other hand, also our rates have gone down, for example the daily rate beginning of January was 50% higher 10 years ago, compared to now. SkiT. : Information age and new technology implementation led to market condition radical changes. How do you think, as far as the Belvedere can meet current market and time’s needs? SkiT. : It is always interesting to take a look into the future. And we want to know, how do you imagine Swiss tourism, Grindelwald resort and hospitality business in 5-10 years? U-B. H.: The Jungfrau railways intend to build two new gondolas. A 10-seater gondola to Männlichen and a 26-seater to Eigergletscher (above Kleine Scheidegg). They will also continue investing in new lifts in the skiing area. Once all that done, Grindelwald will again be one of the most attractive skiing areas in the Alps. Slowly but surely, Asians and Arabs are also visiting Grindelwald in the winter season. We believe, that especially more Chinese and people from India will start travelling and they will all want to visit Jungfraujoch. I personally believe, that the crisis will soon be over, that the occupancy will go up again and that even all year round and not like in other resorts only 3 month in the summer and 4 month in the winter season. I personally believe, that the demand will raise and that we will be able to get better rates soon again, allowing us to make a good profit again, which will also allow us to invest more money into the hotel, to not only keep it attractive but to build also an extension and make it very special. We of course will do our utmost to work with a high quality clientele and we hope that guests from Russia and Ukraine will soon come back in bigger numbers. Grindelwald definitely offers more than most other resorts. Who else can offer excursions like Jungfraujoch or Schilthorn (where James Bond movie was produced), which resort can offer nearby cities like Bern or Lucerne, that can easily be visited, only 60 to 75 minutes’ drive. Which other resort have such beautiful lakes nearby, castles, waterfalls and much more. And, the transfer from the airports is closer than to most other resorts.